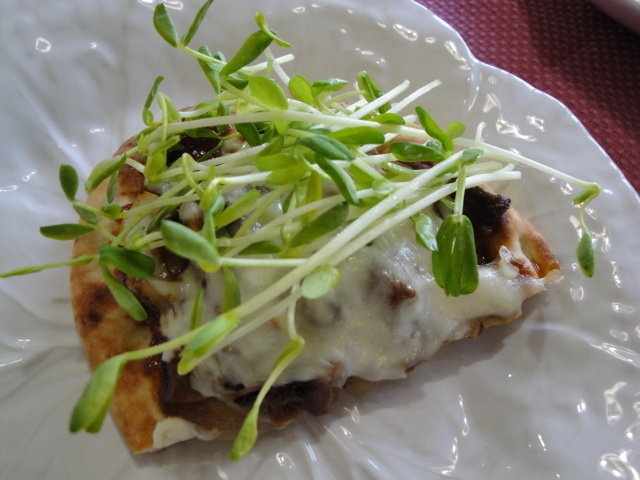 As promised last week, I’m going to give you a simpler version of “Peking” Duck Pizza. In fact if you live in a city with a China Town, you may be able to lose the ” ” from the recipe and make your pizza with authentic Peking Duck. Where I live, however I will rely on another great duck product that has become increasingly available over the years – Duck Leg Confit. Somewhere down the line I will likely show how to make your own Duck confit. It’s actually pretty simple, but for now I’m going back to D’Artagnan and using one of theirs. If you live in Columbus, you can also find great Duck Confit at North Market Poultry and Game. And if you are a vegetarian consider making a “Peking” Mushroom Pizza by losing the duck altogether. 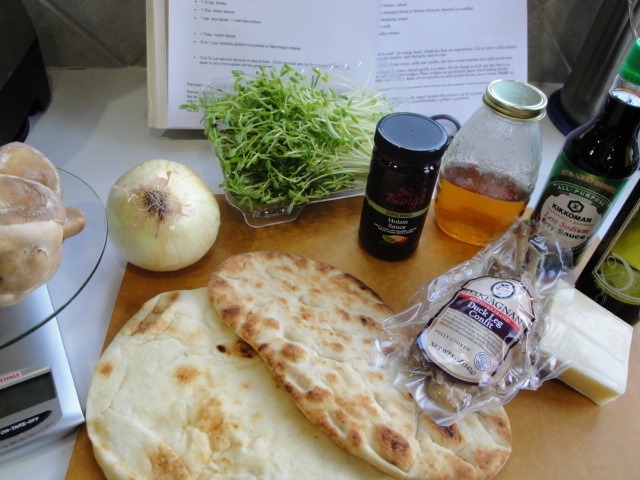 The second short-cut in this post is the use of pre-made Naan for the crust. I like it much better as a fast pizza crust than the pre-made pizza crusts that are in the grocery stores these days. The two brands I like best are La Brea Bakery Naan Bread and Stonefire Authentic Flatbreads. Both have great flavor and texture with no hydrogenated oils or preservatives. This means they have a relatively short shelf-life if kept at room temperature, so I keep my freezer stocked with them. I use them for pizza, sandwiches and of course as a scooper for dal and other Indian dishes. The La Brea breads are approximately 10 inches x 4 1/2 inches and the Stonefire breads are approximately 8 1/2 inches x 7 inches, so both perfect for perfect for a single serving pizza. The Stonefire is a bit thicker and more like a hand tossed crust while the La Brea is a tad thinner and closer to a thin crust pizza. I’m fairly certain you’ll be able to find something to your liking in a grocery or market near you. If not you can always go back to “Peking” Pizza I and make your own. 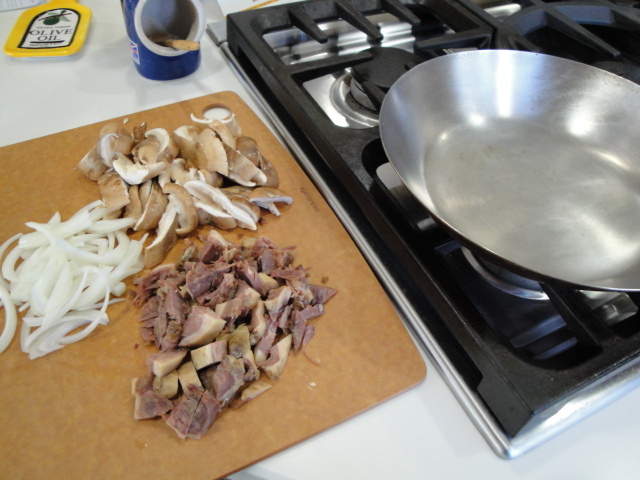 The flavors will be very similar to “Peking” Duck Pizza – I , but the ingredient list is much simpler. And as I said if you want to venture out even further, you could ditch the duck and increase the quantity of mushrooms and onions and have a “Peking” Mushroom Pizza!!! Let’s start with the onion. 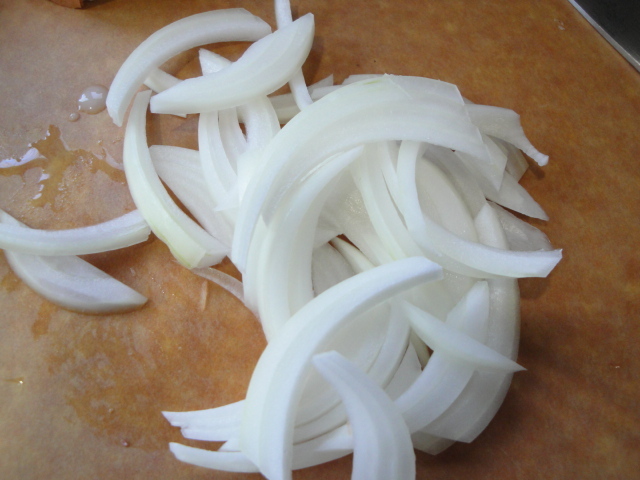 In the first recipe of this blog, I specified slivered onion and from your comments I realize that this is not a well-known term. 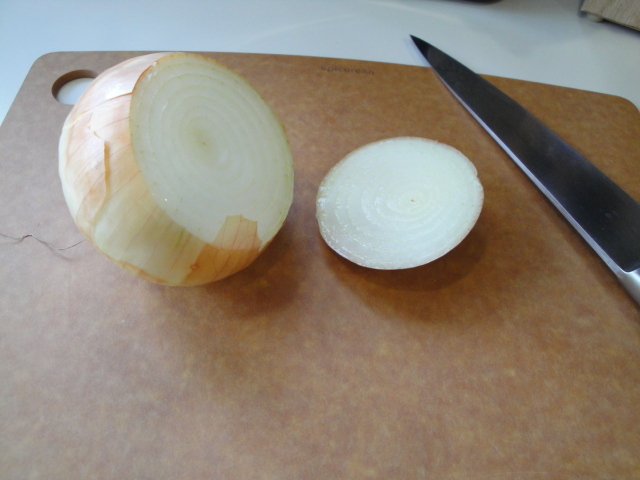 To many this cut is likely called a julienne, but I reserve this term for thin straight strips of food which you will never get from an onion. 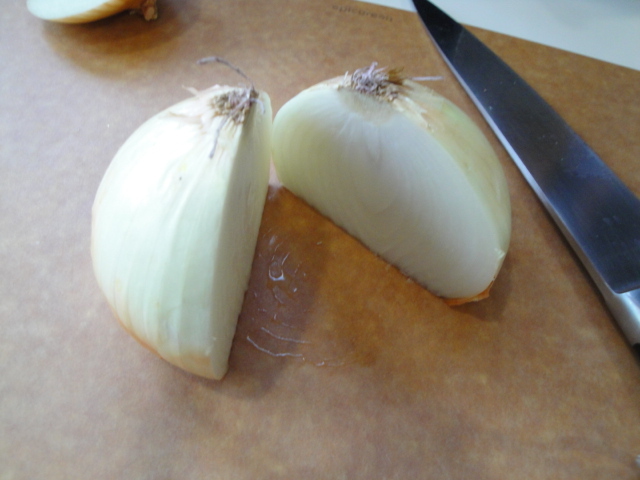 If I cut the onion thinly across its equator I refer to it as thinly sliced. It can be cut into full rounds or half-moon slices. 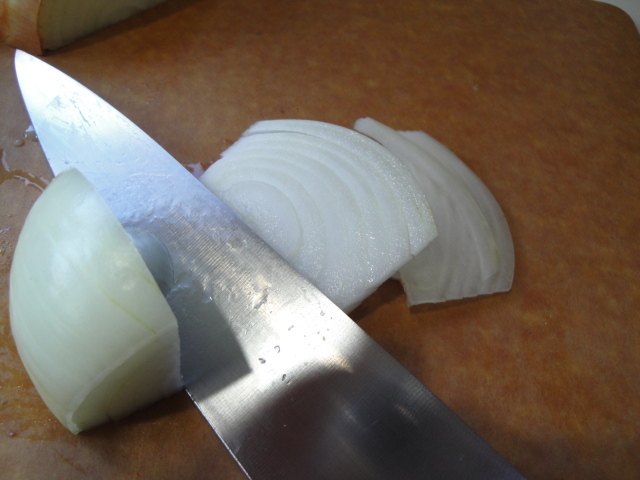 However if I cut an onion in thin pieces from pole to pole I refer to is as slivered. Think slivered almonds. Does it really matter? Probably not, but the slivers will be straighter than half-moon slices and sometimes I like them ;-). 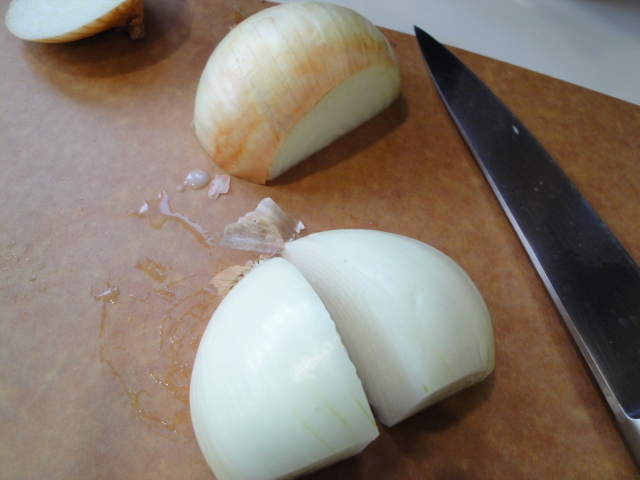 Start by slicing off the stem end of the onion. Then cut in half from pole to pole. When I’m finished I have a nice pile of slivers! Start pre-heating your oven now. It’s not as critical to heat it so long when you are using a pre-cooked crust. Next the duck leg. Cut and pull all of the meat, fat and skin from the bone. Take a little bite because it is fully cooked and yummy just as it is. 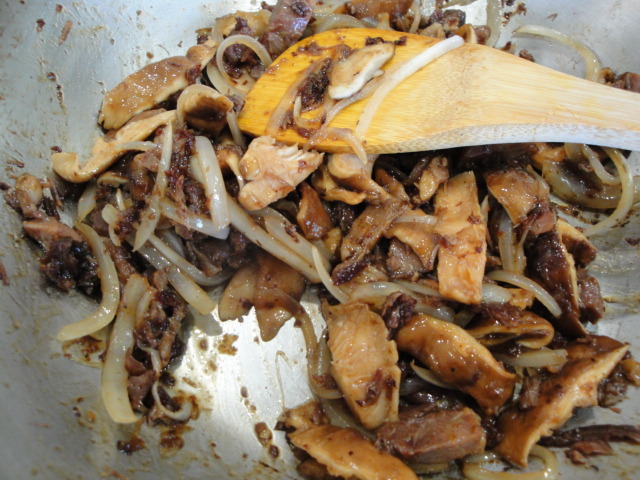 Thickly slice the mushrooms and head to the stove. Start with the duck and the onions, with the duck on the bottom. Heat on medium-high heat until the onion starts to soften and the duck starts to sizzle. Notice that today I’m using a stainless steel pan rather than a non-stick. Either is fine, but the stainless will give me a slightly better sear. When the onion is softened, add the balsamic, honey, hoisin and soy sauce. 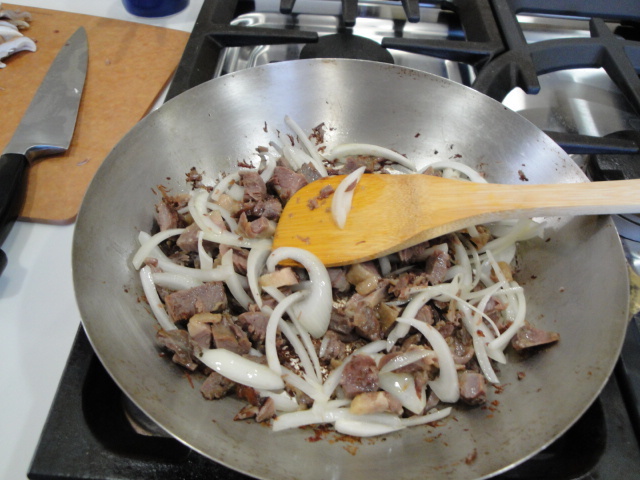 Stir well to de-glaze the pan and get all those yummy duck bits off the bottom. 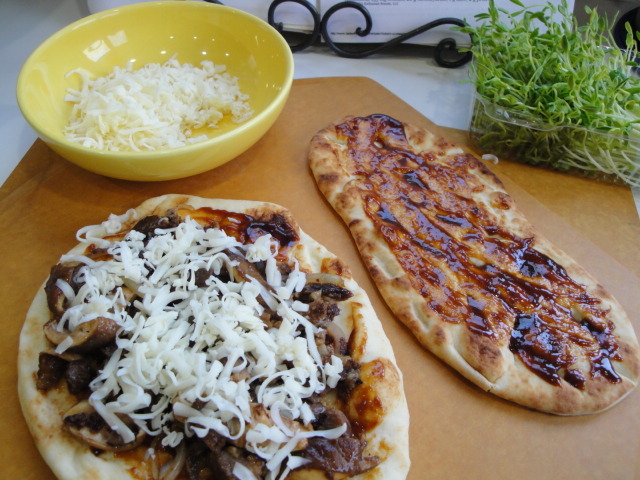 Spread the naan (I’m using both types to show you this difference in shape) with additional hoisin, top with the duck filling and grated cheese (mozzarella today). Pop them in the pre-heated oven. Bake until the cheese is melted and bubbly – approximately 5 minutes. 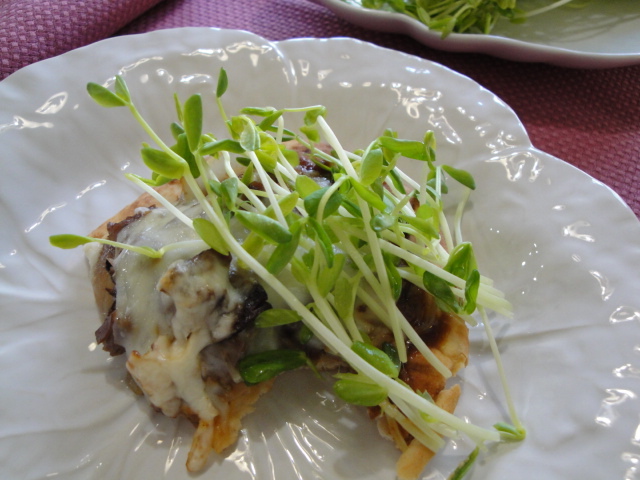 Top with sprouts- today I’m using pea sprouts because they are so pretty. Enjoy!! As you can see from the second shoot, I did. ½ to ¾ cup sprouts-sprouts or pea shoots. Onion sprouts are my favorite but alfalfa, mung bean or any micro-green will be great as well. 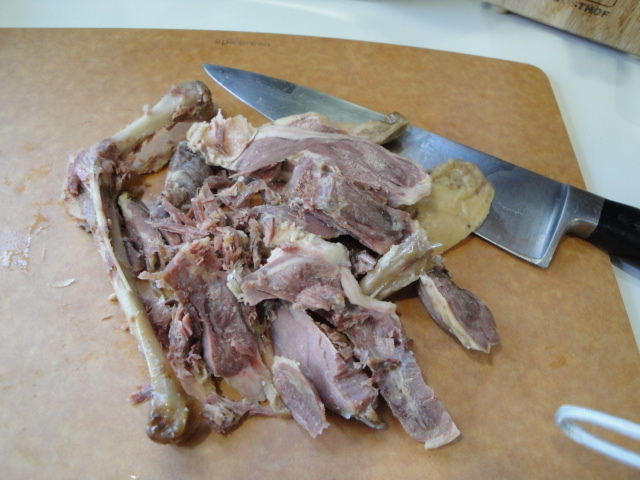 Remove all duck fat and meat from the duck leg confit and coarsely chop. 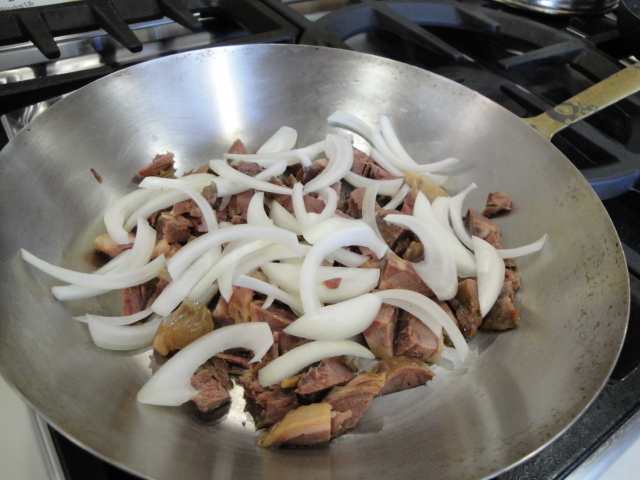 In a medium skillet, heat the duck (fat included) and the onion until the onion just starts to soften. If you are using chicken, you will need to add tsp. or so of oil to the skillet. Add the sliced mushrooms. Cook until the mushrooms are just beginning to soften a bit. 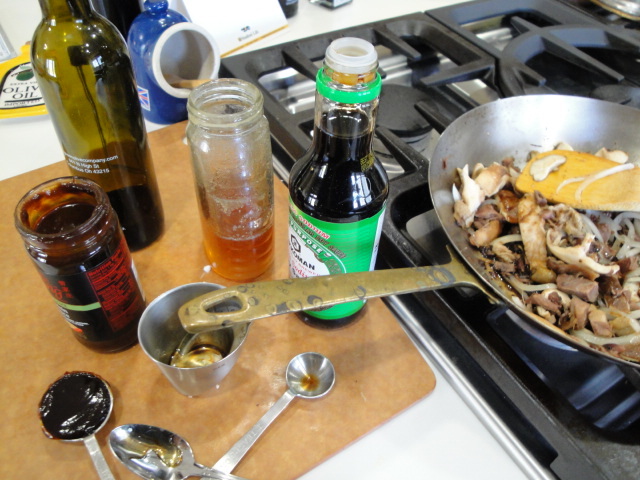 Stir in the balsamic vinegar, honey, hoisin sauce and the soy sauce. Spread the Naan, other flatbread or pre-baked pizza crusts with hoisin sauce. Top with the duck filling and sprinkle with the grated cheese. Place the pizza on the hot stone or on a baking sheet and bake until the cheese is melted and starting to brown. This should take approximately 5 to 10 minutes. Remove the pizza (s) from the oven and top with sprouts. 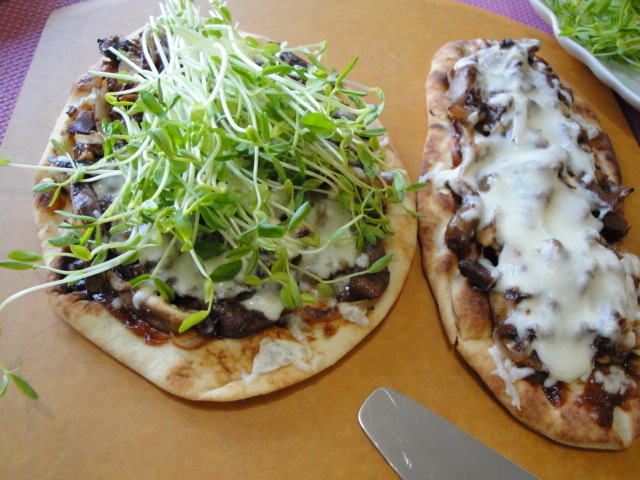 To Assemble & Bake the Pizza using Quick Flatbread Pizza Dough – see post “Peking” Duck Pizza – I.